On occasion of the market launch of the new thermographic cameras with detectors of the next generation, InfraTec’s roadshows are already scheduled for June this year. The main focus of this year’s events is occupied by the thermographic cameras VarioCAM® High Definition and ImageIR® 9300. Furthermore, numerous interesting thermographic fields of application will be discussed and professional thermography software by InfraTec will be presented. 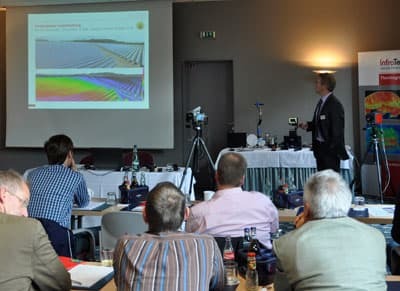 Convince yourself of our competence in infrared thermography and visit us at one of our events, in Germany in the cities of Dortmund, Hanover, Berlin, Frankfurt on the Main, Karlsruhe and Munich, as well as in Vienna (A) and Zurich (CH). Currently the roadshows will only be held in German.